Aiyo, this Miss Ow hor… What does she want the government to do? Help her look after her money? That’s what the CPF is for! And people have complained that it’s too rigid, and they can’t use it til they are old and senile… You just can’t satisfy everyone out there. Everybody has to take up the responsibility on how you invest your money. There’s no perfect investment instrument in the world. Every single kind of instrument comes with risk. Even Ponzi schemes make money for some people – the people who entered early and stopped investing after the first wave. We have also seen bank offerings such as the Mini bonds, which was supposed to be a low risk product fail because a complicated product has been misconstrued as a simple bond investment product. For people who have put money into all forms of investments, be it stocks, mini bonds, ostrich eggs (yes! I have read about them), plantations, trees, properties, koi fishes, commodities, unsecured loans, and all various other creative forms of investments, they have to take responsibility for their own money. They can’t expect the government, after mother-coddling them on all other things, to do it for them? A big part of investing is to do one’s homework. Of course, even after due diligence, there is still a chance of failure, which is inevitable. Or else, just leave the money in the savings account which earns you 0.0125% annually, and lose it safely to inflation. 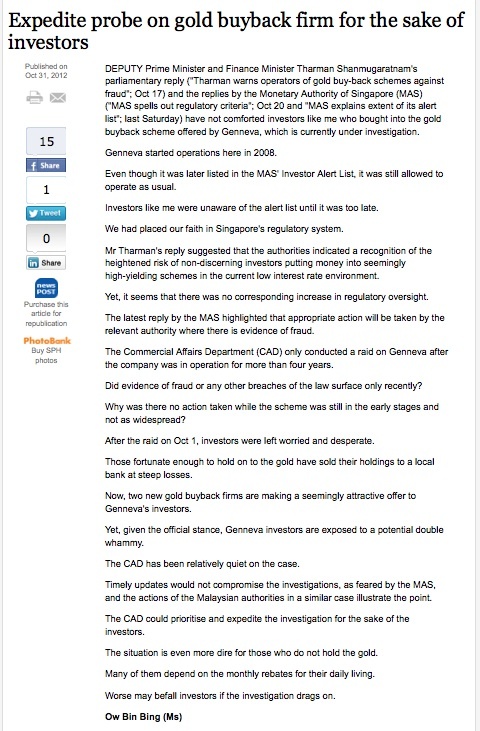 As for people like Ms Ow, in the first place, the companies have already been put on the alert list, which is widely published on the MAS website. Part of the homework before investing, is to check out lists like this. Before the days of the internet, this may be more difficult, but nowadays, with a search on Google, it will turn up numerous articles. Since she knows how to send a letter to the Forum, looking up information on Google shouldn’t be a barrier to her. Of course at the end of the day, the investor still has the call, whether or not to invest. If she thinks it’s a ponzi but it’s only like 1 day old, well, maybe money can still be made, because she may belong to the “1st wave”. She has mentioned that she has placed faith on the regulatory system. Regulatory systems can just go so far. Even when there are laws and police patrols, there are still crimes being committed. If you place something valuable in full view and easy accessibility, what’s stopping a thief from taking it away. It all boils down to personal vigilance. How far does she expect the government to stretch to take care of her? There are so many more unfortunate people out there to take care of. She mentioned that people depend on the payouts for daily living. What about companies which fold and retrench their employees who depend on them for daily living? Have they committed a crime? At the end of the day, you have to be accountable for your own decisions. Stop expecting the government to take care of everything for you. It’s sad that people lose money through investments but who hasn’t? Just treat it as a lesson in life, move on and make sure that you don’t commit the folly again. Government so busy, everything also must do. You anyhow put your money also government’s fault. Aiyooo…!! Joker.. sometimes I feel Singaporeans are too sheltered in their world that they didn’t bother to see and appreciate what the country has done.. Sure I have my fair share of complains and disagreements.. But wth she nv check that 1 most important thing which is MAS list before investing then she wanna blame the gov.. She should really blame herself lo.. Buy beauty product also need check online for reviews lo.. The government has been overprotective of us. It reminds me of a parenting article I’ve just read. Points 2,12, 13, 14. They have been overprotective, sheltered us from trouble and decided what’s best for us. In doing that, they have encouraged a bunch of “children” who are taking everything for granted, whine when every slight thing doesn’t go their way, and naive to the dangers of the world. Zhiwei, slap high 10! Everything has become the government’s fault. Where has the basic sense of ownership and responsibility for one’s very own decisions gone? People lay blame lor… Everything conveniently blame government.